Change things up with a short trip to Salt Cathedral in Zipaquira (about 50 minutes away). There's still lots to do: examine the collection at Gold Museum (Museo del Oro), take a stroll through La Candelaria, admire the masterpieces at Museo Botero del Banco de la Republica, and tour the pleasant surroundings at Ciclovia de Bogota. To see ratings, more things to do, other places to visit, and more tourist information, read Bogota tour planner. Boston, USA to Bogota is an approximately 14.5-hour flight. Traveling from Boston in March, you will find days in Bogota are much hotter (67°F), and nights are a bit warmer (49°F). Finish your sightseeing early on the 28th (Tue) so you can travel to San Agustin. On the 29th (Wed), pause for some photo ops at La Chaquira, then head outdoors with Estrecho del Magdalena, and then pause for some photo ops at El Tablon. 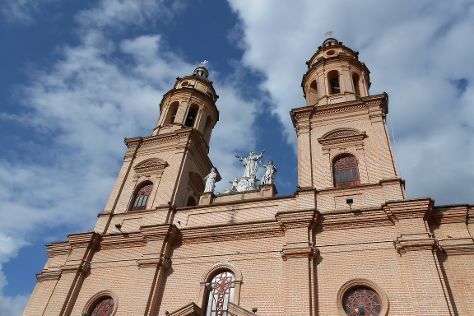 On the next day, take in the architecture and atmosphere at Iglesia de San Agustin, then explore the ancient world of San Agustin Archaeological Park, then take in the architecture and atmosphere at Parroquia Nuestra Senora de Lourdes, and finally make a trip to Parque Arqueologico Alto de los Idolos. To find photos, more things to do, maps, and more tourist information, go to the San Agustin itinerary builder. Do a combination of flight and taxi from Bogota to San Agustin in 2.5 hours. Alternatively, you can drive; or take a bus. Plan for somewhat warmer nights when traveling from Bogota in March since evenings lows in San Agustin dip to 67°F. Finish up your sightseeing early on the 31st (Fri) so you can go by car to Pasto. Pasto sits in the Andes mountain range at an altitude of 2,527 m (8,290 ft) above sea level. Pasto is known for religious sites, nature, sightseeing, museums, and historic sites. Your plan includes some of its best attractions: explore the activities along La Laguna de la Cocha, admire the striking features of Centro historico de Pasto, take in the spiritual surroundings of Las Lajas Sanctuary, and pause for some serene contemplation at Iglesia de Fatima. To find where to stay, more things to do, other places to visit, and other tourist information, read Pasto trip itinerary planner. Drive from San Agustin to Pasto in 5 hours. Alternatively, you can drive; or do a combination of taxi and bus. Plan for little chillier nights when traveling from San Agustin in March since evenings lows in Pasto dip to 59°F. Finish your sightseeing early on the 3rd (Mon) to allow enough time to take a bus to Popayan. Popayan vacations hold plenty of appeal for international and domestic visitors, as the city represent one of the most entertaining and culturally enriching urban centers on the continent. Start off your visit on the 4th (Tue): don't miss a visit to Teatro Municipal, admire the striking features of Panteon de los Proceres, then make a trip to Kathedrale Basilika von Popayan, then don't miss a visit to Parque Caldas, and finally pause for some serene contemplation at Iglesia de San Francisco. Get ready for a full day of sightseeing on the next day: make a trip to Torre del Reloj and then make a trip to Puente del Humilladero. For ratings, maps, photos, and other tourist information, read our Popayan itinerary planner. Getting from Pasto to Popayan by bus takes about 3.5 hours. Other options: drive; or drive. Traveling from Pasto in April, you will find days in Popayan are a bit cooler (66°F), and nights are somewhat warmer (66°F). On the 5th (Wed), wrap the sightseeing up by early afternoon so you can drive to Salento. When in Salento, make a side trip to see Parque del Cafe in Montenegro, approximately 1:05 hours away. Spend the 6th (Thu) exploring nature at Bosques de Cocora. There's lots more to do: look for all kinds of wild species at Kasaguadua Natural Reserve, pause for some serene contemplation at Iglesia Nuestra Senora del Carmen, and indulge in your favorite hot beverage with a coffee and tea tour. To find photos, more things to do, where to stay, and tourist information, read Salento travel itinerary planner. Traveling by car from Popayan to Salento takes 5.5 hours. Alternatively, you can fly; or take a bus. When traveling from Popayan in April, plan for a bit warmer days and about the same nights in Salento: temperatures range from 82°F by day to 64°F at night. Finish your sightseeing early on the 9th (Sun) so you can travel to Bogota. Start off your visit on the 9th (Sun): take in nature's colorful creations at Jardin Botanico Jose Celestino Mutis and then shop like a local with Parque 93. To find photos, more things to do, ratings, and other tourist information, refer to the Bogota online itinerary creator. Do a combination of bus and flight from Salento to Bogota in 3 hours. Alternatively, you can do a combination of taxi and flight; or drive. Prepare for little chillier weather when traveling from Salento in April: high temperatures in Bogota hover around 66°F and lows are around 50°F. Wrap up your sightseeing on the 10th (Mon) early enough to travel back home.